The person who prepares this form states that he or she is the person, executor, guardian, authorized officer, or agent of the person for whom mail would be forwarded under this order. Anyone submitting false or inaccurate information on this form is subject to punishment by fine or imprisonment or both under Sections 2, 1001, 1702 and 1708 of Title 18, United States Code. 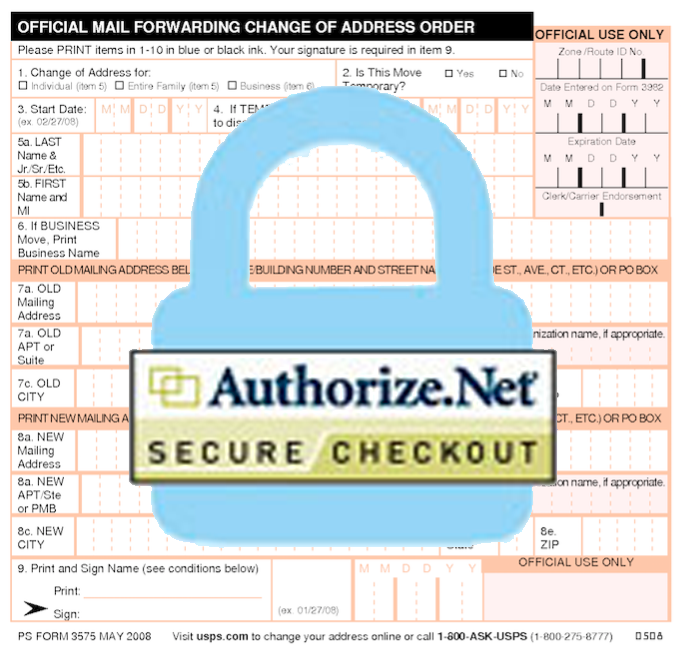 I also hereby authorize you to file Change address USPS documents on my behalf as an authorized agent and agree to all terms of service related to this website and it's parent company please allow up to 7 days for processing. By submitting this form you are also acknowledging that we are not the united states postal service and that we are a filing service working on your behalf. You understand that we prepare the necessary forms required to complete a change of address so you can print and mail from the convenience of your own home. We will file unlimited address changes for you for up to three months. You also agree that once the form is prepared it is your responsibility to follow the instructions to successfully complete your change of address. By checking this box you agree that you will not hold us responsible or ask for a refund for incorrect information you provided or lack of action on your part or any other party once the form is prepared and delivered to you. Please note: E-Debit online check payments can not be refunded. Did you file an address change? Great, now its time to get to packing! Make sure your boxes aren’t too heavy. Keep in mind that an cardboard box probably won’t be capable of holding more than 50 pounds. Also, it is the maximum weight that a person can lift safely. You may probably need to take the boxes up and down stairs so keep in mind if they're too heavy you won't be able to move them easily. Some objects are large and heavy. Please don't attempt to move them yourself if they're too heavy. Get someone to help you so you don't hurt yourself! Incautious and unprepared movers can easily hurt their back when moving. You can avoid this by stretching your entire body a bit before lifting heavy objects. This way, you can reduce your chances of back trauma. By stretching, you can prepare your entire body for the lifting. You should wear closed shoes and loose clothes instead of sandals. They may hurt your toes. Instead of sandals, wear shoes that provide a good grip. Be careful when lifting objects. Try to end your knees and push your waist back to be safe. This way, you can transfer weight onto your legs and protect your waist and back. If you do not bend your legs while lifting objects, the entire weight will be on your waist. This can lead to backache or even spinal problems if you don't stretch and take a little caution when moving. Dollies can be very helpful when moving furniture. Be certain to wear gloves because they provide a stronger grip, also gloves can also offer great protection for splinters.